Members of the new, Oblate Grotto Community of the Oblate Associates await the beginning of Mass with their Oblate companion, Fr. David Muñoz. 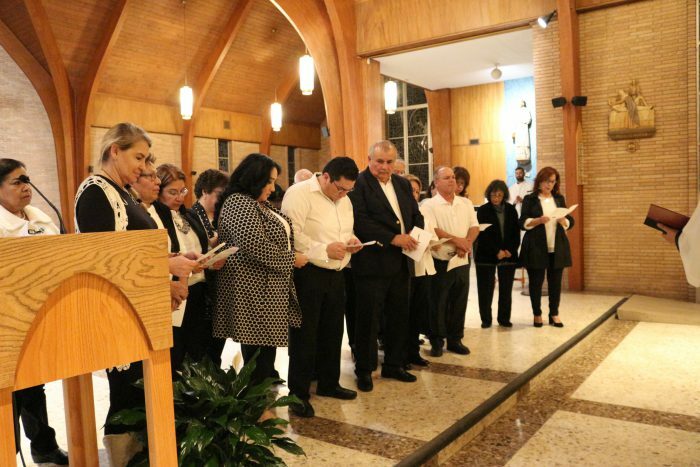 The Immaculate Conception Memorial Chapel on the campus of Oblate School of Theology in San Antonio was the scene of a very special celebration held on January 24, 2019. 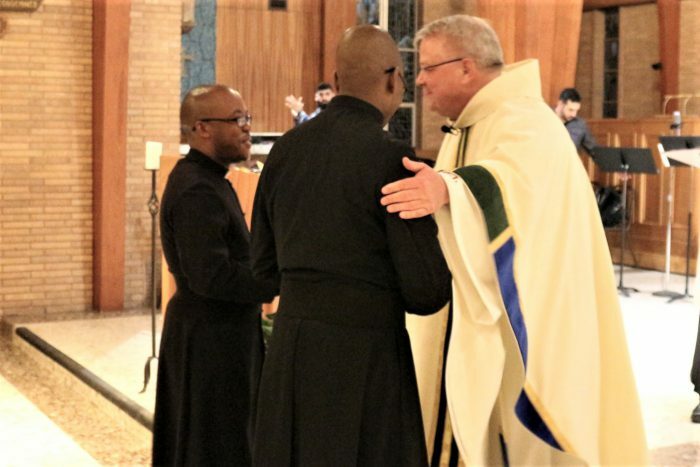 In addition to the Eucharistic Celebration, three special events occurred during the Mass: two Oblate Scholastics renewed their vows, continuing their journey toward religious life; a new group of Oblate Associates made their formal commitment; and the Provincial accepted the gift of a beautiful new icon of the Founder, St. Eugene de Mazenod. All of this happened in front of a congregation that included special guests made up of some 40 delegates and leaders of the first Mazenodian Family Congress which happened to be meeting at the Whitley Center at OST. Sch. Bro. Justinus Moloi and Sch. Bro. Fani Zane Nong pose next to the new St. Eugene icon that was presented to Fr. Studer during the Mass. 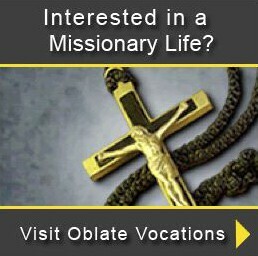 U.S. Oblate Provincial, The Very Rev. 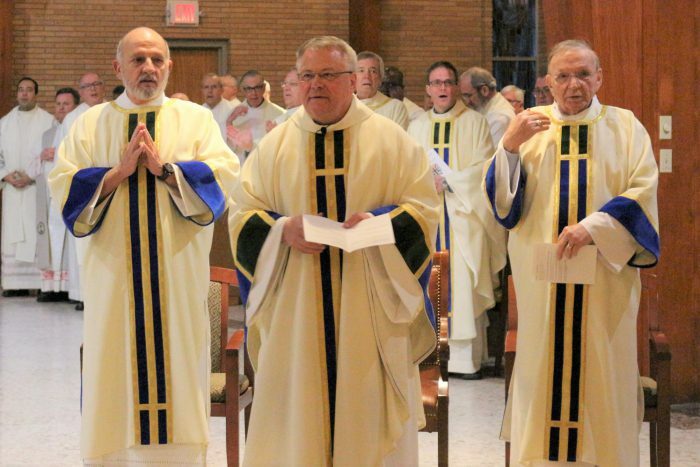 Louis Studer, celebrated the Mass and guided the scholastics through their renewal of vows. The two men are Sch. Bro. Justinus Moloi from Lesotho, and Sch. Bro. Fani Zane Nong who comes from Botswana. 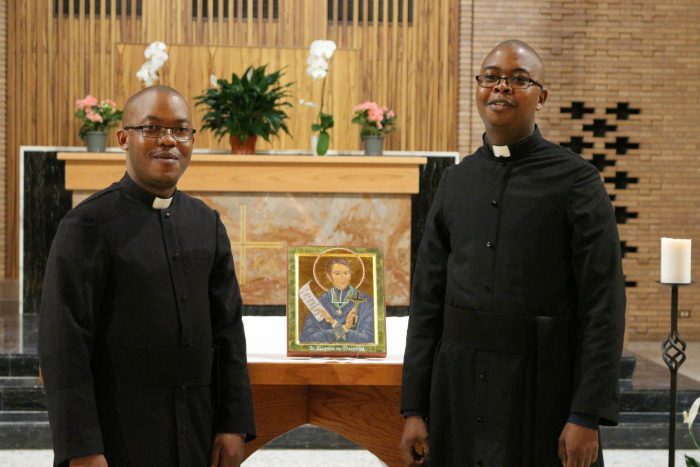 Both young men are in the U.S. for the first time studying at Oblate School of Theology during their first year of Theology at the Blessed Mario Borzaga Formation Community. The Scholastics stand before Fr. Studer during the vows ceremony. Fr. David Uribe, OMI is on Fr. Studer’s right. 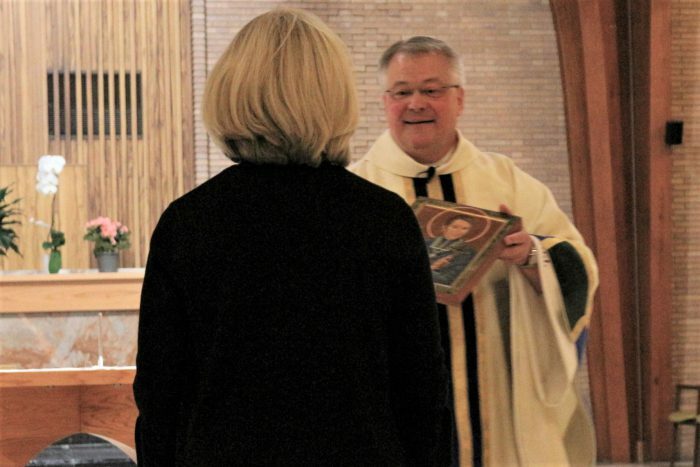 Next, the new community of Oblate Associates affiliated with the Oblate Grotto came forward to make their one-year commitment and receive their Oblate Associate’s crosses. This is a brand-new community of Associates, having begun in April of 2018. 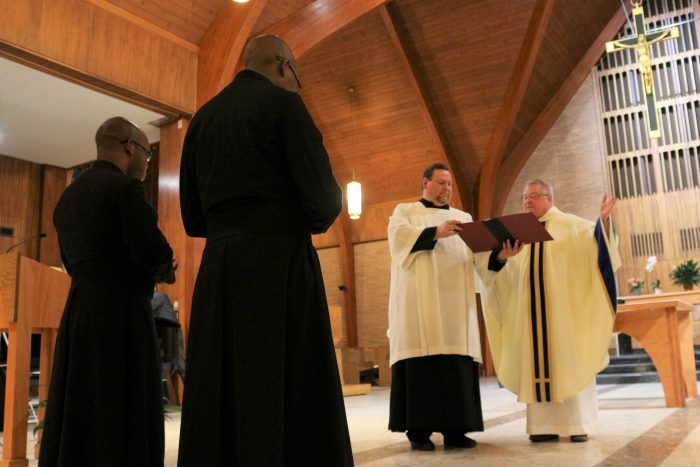 Since that time they have been in formation with Oblate companion, Fr. David Muñoz, OMI. 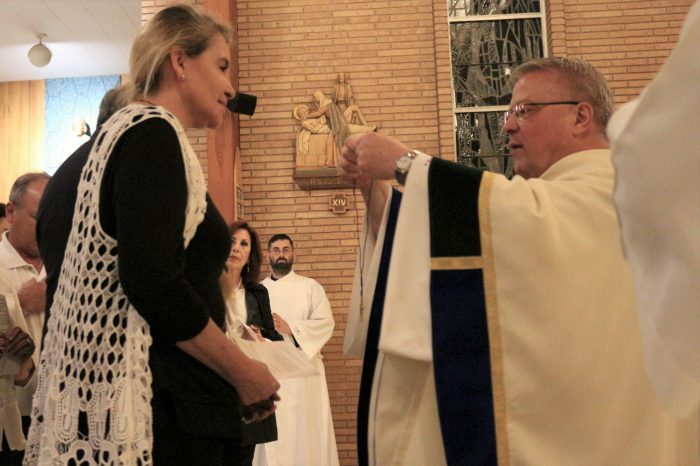 Group coordinator, Patricia Lanfranchi, receives her cross from Fr. Studer. 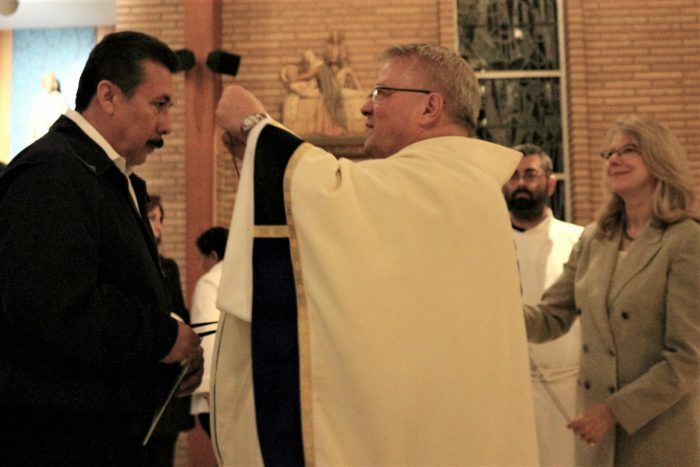 Another new Oblate Associate receives his cross from Fr. 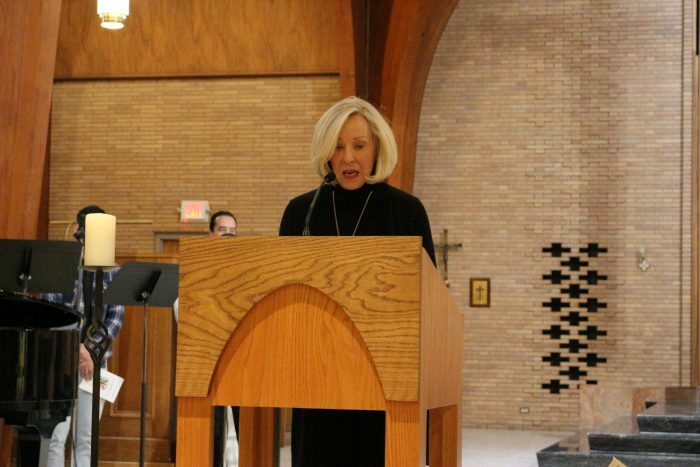 Studer as National Director of Oblate Associates, Geri Furmanek (on right) looks on. 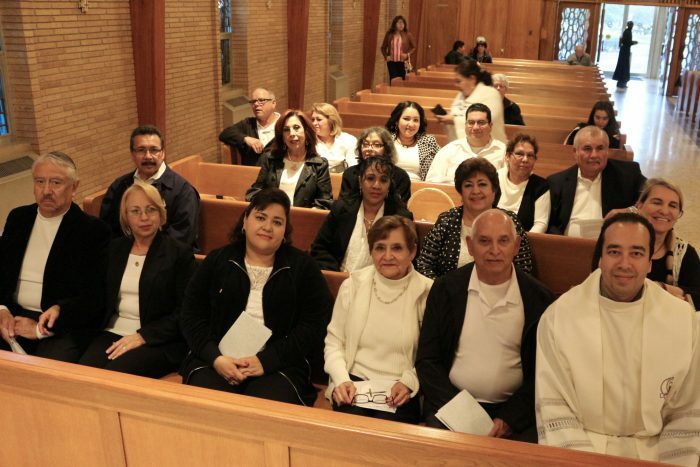 The primary ministry of this Spanish-speaking community is hospitality during Eucharistic Celebrations at the Oblate Grotto where Fr. Saturnino Lajo, OMI (among others) celebrate Mass with huge crowds on Sundays. 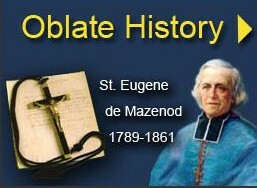 The final special event was the presentation of a new icon of Oblate Founder St. Eugene de Mazenod. 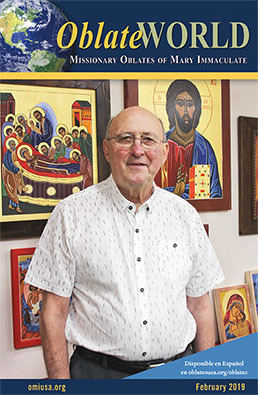 Artist, Lauretta Agolli, presented the icon to Fr. Louis Studer. After Ms. Agolli made a few remarks about the icon, Fr. 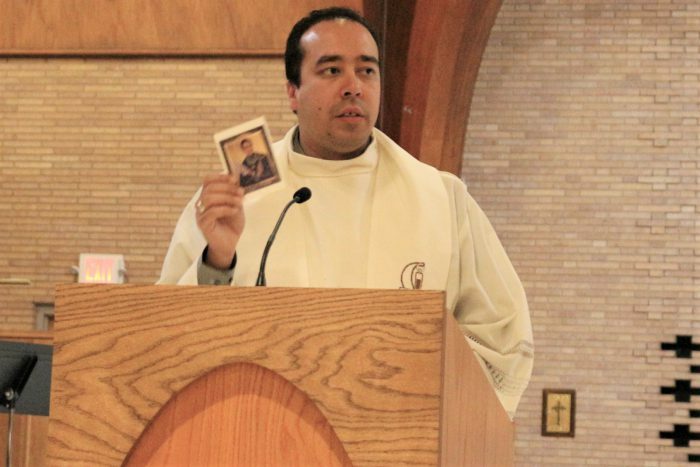 David Muñoz announced that the image of the icon had been made into prayer cards that would be available to everyone in attendance. 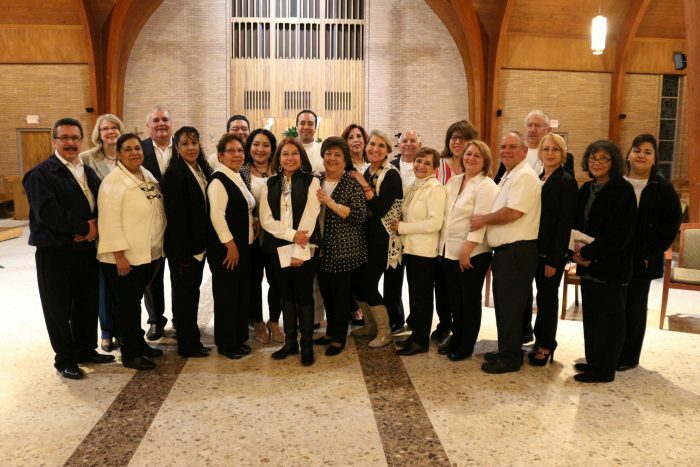 At the end of Mass, a celebratory dinner was held at the Oblate Retreat Center. Fr. Muñoz announces the availability of the prayer cards. 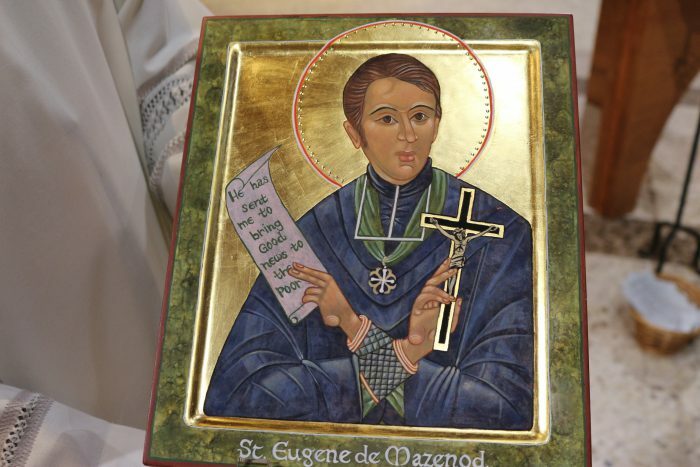 A close up of the new icon of St. Eugene de Mazenod.